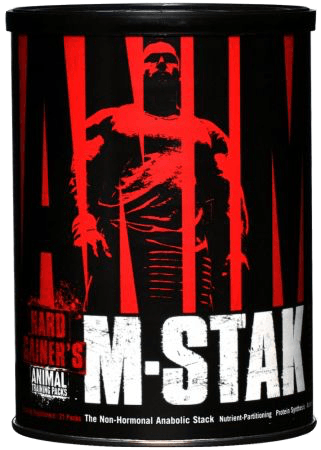 Animal M-Stak – Hardgainer formula! This could be my current favourite in the Animal range, I love products that increase protein synthesis via non hormonal pathways and this formula is jam packed with them! There are multiple plant sterols included, also known as Ecdysteriods which are essentially a steroid that also naturally occurs in the insect world (sourced here from plants with the same compounds) these are known to enhance protein synthesis in the muscle and also boost libido, see some of the research here: https://examine.com/supplements/ecdysteroids/ the trick with Ecdysteriods is in the absorption and this formula has three added compounds to assist absorption, including the powerful digestive enzyme inhibitor Grapefruit extract. But as usual with Animal products the list of ingredients doesn’t stop there, with a full gamut of insulin mimtec ingredients that will have your carbohydrates shuttled straight into your muscles, the ingredient profile for this is just as comprehensive as a standalone insulin Mimetic like Glycobol or Glycolog so for the price tag this is very impressive. The list goes well beyond the features I mentioned and for anyone looking to put on mass with a non hormonal approach would benefit greatly from this formula. Remember to track your calories when gaining as there would be no point running this product without enough calories to make full use of the elevated protein synthesis. What is anabolic? Muscle building and the processes that lead us down the road to new growth… Protein synthesis. Nitrogen retention. Nutrient-partitioning. What is Animal M-Stak? A natural, non-hormonal supplement designed for the most stubborn of all ‘hardgainers.’ From green beginner to diehard vet, we’ve all gone through it – skidding to a halt, our progress idles on a plateau. Can’t gain another pound, workouts are stale, lifts are static. This is the hardgainer’s syndrome, and from the most slender of ectomorphs to the most muscular endomorph, we’ve all been there. Desperate to ignite new growth, we’ll try almost anything. For those of us so dedicated to the iron game, these moments of frustration have come to an end in the form of Animal M-Stak. We’ve also included key ‘anabolic adaptogens’ such as Safed Musli, Muira Puama, and the isoflavones from Kudzu. Together these natural herbs and extracts have been suggested to help increase physical training capacity, improve endurance, minimize the catabolic stress response, decrease mental fatigue as well as support sexual health and boost support system function. These are critical factors for naturally enhancing ones performance levels in the gym. M-Stak floods your system with an abundance of anabolic nutrients, switching your muscle-building signals on and amplifying them. Combining flavones and sterones in hefty doses with the most anabolic of amino blends supported by an array of cutting-edge adaptogens in a single pre-training pack designed for optimum absorption and convenience, the new Animal M-Stak takes non-hormonal lean mass nutrient partitioning to a whole new level. Animal M-Stak, The Non-Hormonal Anabolic Stack, has come to turn ‘hardgainers’ into ‘hard’ gainers.